The Film Sufi: The Treatment of Love in Soren Kierkegaard’s "Either/Or"
The Treatment of Love in Soren Kierkegaard’s "Either/Or"
In S. Kierkegaard’s Either/Or  the reader is presented with two presumably mutually exclusive alternatives for conducting one’s life. In particular, the judge, B, who presents the ethical position, attempts to resolve the aesthete’s (A’s) misgivings about marriage by presenting its aesthetic validity. This argument of B’s, I submit, offers no real advancement from the aesthete’s quandary. B sees the life of A as inadequate for attaining satisfaction, and B goes on to insist that there is a better method available for conducting one’s affairs. But A, of course, is a complex individual, and it is important for us to see B’s view of A’s life and what assumptions he has made about it. First of all, B senses that A is not satisfied. Here we like to say of satisfaction that it means one’s being at one with oneself. But this doesn’t tell us much; what do we mean by “being at one with oneself”? So for the moment, anyway, let us assume that there is a common understanding of the existence of the state of satisfaction (albeit intuitive), although we don’t have a full understanding of the term, because we don’t understand how this state comes to be. This is just the subject of the present inquiry. Thus we’ll have to settle for the idea that one knows when he himself is satisfied, but knows little of the nature of this satisfaction qua satisfaction. Thus we might say that A is not satisfied and spends a great deal of his time in quest of this satisfaction. We are also given the information that A finds some things interesting but most things boring. In fact A speculates that boredom is the root of all evil. But what is the nature of the interesting or the lack thereof (boringness)? This again is not defined for us, but it seems somewhat linked to A’s satisfaction – when A is bored, he isn’t satisfied. These intuitively-based polarities are significant. It is not that S. K. has done an inadequate job of clarifying the concepts he uses, but that he begins with certain concepts that cannot be explained in terms of other concepts, but which instead relate directly to experience. Now for a man to be his own fate is clearly a contradiction in terms. For a man to determine his own fate, he must reflect on the manifold of his potential activity. When he so reflects, he becomes somehow disengaged from the manifold – he no longer experiences it in its immediacy. This disengagement destroys the interesting nature of it and all emotional attachment; meaningfulness is lost. A is aware that some elements in the manifold are destined to be interesting to him, but he does not know which ones. Nor can he determine this by direct reflection, since the accompanying disengagement prevents him from feeling any meaning. B seems to indicate that A is unaware of this contradiction and of the impossibility of his task. The judge wants to present the ethical as highly aesthetic to A – in particular, marriage is to be justified aesthetically. B’s plan is for a human being to choose himself, that is, will that which has already been assigned to him. The necessity of choosing among many equally meaningless elements of a manifold is now obviated. The choice has already been made for the subject as to who he is, and one must only affirm this determination. The important thing for B is that one must will himself, and by so doing, one actively engages himself with the manifold again. 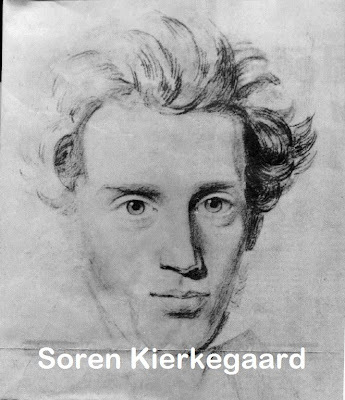 By this exercise of the self, life again takes on meaning for the ethical man, since he has chosen something from the manifold of possibility (himself) and has restricted himself from participating in the other possible choices (those which are not himself). Thus the ethical man takes on a commitment and a sense of meaning. How is this program applied to love? B says that here again the choice has already been made; one need only affirm it. One must, in this case, choose his first love, i.e. he must commit himself to his first love. B willingly admits that the term first love is difficult to pin down, but he apparently has a sufficient understanding of the term to apply it to himself – “although I have been for several years a married man, I still have the honor of fighting under the victorious banner of first love.”  Here by committing oneself to one’s love, one establishes a dialectical subject-subject relationship that has dynamical characteristics. For such lovers, “‘the first’ is simply the present, but the present is for them the constantly unfolding and rejuvenating ‘first’” . In other words, one must live every moment in its total uniqueness and thereby obtain the eternal in the temporal (implying, among other things, satisfaction). B says of A, “your life is wholly given over to preliminary runs” . Thus B insists that A is presented with occasions, some of which he finds interesting. The repetition of the situation is often boring to A, so he is constantly looking for new areas of stimulation. His life becomes a series of discontinuous moments over which he tries to assert control but cannot. B himself, on the other hand, by actively willing the first love, feels that he continually lives in the moment of first love. We could say then that the judge present to us a method for aesthetic fulfilment, which in this discussion, of course, stands or falls solely on its aesthetic merit. Now to what extent are the assumptions of B superior to those of A? B states at the end of his letter that he has “shown . . . that conjugal love has it conflict in time, its victory in time, its blessing in time.”  The dialectical, inner historicity of conjugal love allegedly provides a continuity across time, an eternal present, that is lacking in A’s life. The lack of continuity of A is that to which B is most sensitive, but this is more of an outward manifestation of A’s problem rather than the cause of it. A and B recognize a number of the same things. They both realize that occasions present themselves to their experience, some of which are significant, e.g. they both would agree that the moment of “first love” is significant). They both intuitively feel that man has the freedom to so structure his life that he can find some aesthetic satisfaction. By aesthetic satisfaction I mean activity that has its own justification. The two advocates both agree that there is a substantial element provided, in this particular case, love, from the outside; they have no control over it. The judge attempts to fashion marriage from this raw material, while the aesthete shrinks from the idea. A, however, is now without a program. He is sensitively aware that he has no control over the occasion which supplies content to his life. He can, nevertheless, increase the probability that an occasion will present itself, and his genius lies in this direction. For one thing he is aware that somewhere in his manifold of experience an interesting occasion might lie. When part of this potential is kept from him, the aesthete is painfully aware that he might be foregoing the opportunity for an interesting moment. Thus A avoids the possibility of an interesting moment being eliminated due to a restriction of his manifold. By refusing to restrict his manifold, A refuses to commit himself and remains detached from all things. Since his moments are always infinitesimal durations of time, A is almost always dissatisfied and bored. Thus marriage would be a drastic restriction of A’s opportunity for love and would violate his freedom. A has other means of increasing the probability of his being interested, though. He devises the “rotation method”, by means of which A varies his moods so as to be in the most receptive condition for an interesting occasion. As was stated above, A’s disengagement from the world prevents him from experiencing any meaning or significance, i.e. his very concern that he keep open all possibilities for the interesting pr event him from apprehending the interesting. Thus A has conceived of the idea of the art of remembering – when an interesting occasion presents itself, A attempts to reflect upon it right at the moment of its occurrence. Then later on, he can remember this reflection and thus approach as closely as possible the moment of the interesting (since reflection cannot apprehend the interesting itself). This indicates that A is quite aware of his own inability to reflect on the immediate, he can only evoke indirectly, perhaps, the mood he felt at the prior moment. The one problem with this is that the repeated reflection on the same thing become boring. This points us to a fundamental difficulty with A’s method – his reflections lack the substantial quality that experience has. To fend off the boring, A has the freedom to make his reflection appear before him in different perspectives each time. But this very freedom to manipulate his reflections is in the end self-defeating, because both reflections of the existent (memories) and of the unreal (fantasies) lack the substantial character of immediate experience. Ultimately, it becomes difficult to distinguish between the two reflective modes (i.e. memories and fantasies). B’s point of view is similarly lacking a mechanism to account for the substantial quality of experience. For example he is totally unable to explain the emergence of first love, yet he is quite willing to build his life on this unexplained phenomenon. To do this he must assume that first love is the only true love. B is aware of freedom in the sense that one is free to choose that which has been present to him (first love). By this B means that one must commit oneself to one’s love, but at the same time be free from the need of one’s love (free from encountering the loved one categorically as an object that can be manipulated). Thus B not only chooses one element (the beloved) out of the manifold, but does so in a different manner (subject-subject encounter, rather than subject-object). He then asserts that a dialectical inner history will result that perpetually maintains the first love. This implies that B knows something about the occasion, yet we know he doesn’t. His assertion that first love (which comes from outside him) is maintained perpetually by conjugal love must be pure guess, since he knows nothing of the nature of the emergence of first love. This naiveté was even articulated when B admitted that first love must precede conjugal love. What is really behind the judge’s arguments concerning the nature of love? The occasion presents love to a person from outside himself. Hence his failure to understand the reason for his love. The judge says that a man is free to commit himself to his love or not to commit himself. But this act of will implies a subject that is alienated from the task. To will something is to see oneself up against an obstacle which must be overcome – a task is set before one. Thus when one wills, one is alone; he is in a state of alienation (a subject-object situation) from that on which he operates. But this is not the nature of love. It would destroy love’s immediacy. One does not operate on one’s love, but instead receives the love. The establishment of a love relationship is not willed, but rather the subject opens oneself to the possibility of this being established from without. Indeed, freedom is incompatible with love, for love provides the subject with meaning. Love endows a man’s life with meaning; he cannot endow his own life with meaning. That is not to say that one has no freedom in dealing with one’s love, but that one cannot affect the nature of love by any willed activity. Thus the failure of both A and B is due to their inability to posit a mechanism for the establishment of content. If they do not understand the nature of love (how it comes to be), then their methods of dealing with it in experience are arbitrary and without meaning. Thus in some sense A’s position is more viable than B’s, because it recognizes its own inadequacy. His position recognizes its ignorance of the nature of the occasion and thus wants to provide itself with maximum flexibility to experiment. B, on the other hand, provides no treatment of the possibility of departure of the love content from marriage. Since love’s coming to be is unexplained, its departure is also unapproached. He might try to get around it by saying the “first love” lasts forever, but then he is only providing his own definition of the term “first love”, which may have no real significance beyond this. A demands freedom from the boring (lack of content), and marriage is very boring without love. Since noone understands how love comes to be or passes away, A refuses to bind himself to some situation which is based on the naive belief that the content will always remain in it, that first love lasts eternally. Thus B’s claim that A, by reflecting on experience is unable to relate himself to the content of experience, misses the point, since both A and B are equally alienated from love – B being equally alienated because by committing himself to his love, he thereby objectifies her. Finally, B’s claim that he has solved the problem of temporality is untrue. The dialectical process does not extend the quality of the moment across time. An analogy can be made to the field of music, where B’s program is analogous to rhythm. Although rhythm does extend itself across time and is a function of time, it is only a structure for the music. Rhythm cannot create music or ensure that music will continue. It is nothing without the music, and therefore A would rather go where the music is, rather than attempt to stay in one place and structure it rhythmically, when it might at any moment depart. The fact that A and B are unable to provide a mechanism for the coming to be and passing away of love may point to a fundamental impossibility for human understanding of the essential immediacy of love. It seems that the real difficulty is man’s freedom. A and B presuppose that some kind of freedom exists for man. This very freedom seemingly enables man to endow his existence with content, but this is deceiving, because at the same time it removes the essential meaning or value from a choice. A choice implies that other acts could also have been willed and thus a certain arbitrariness enters. The meaning and power of love precludes a choice with regard to its meaning qua love; one can only choose to do things that are at best indirectly related to love. Thus it may be impossible for a human being, existing in a state of freedom, ever to understand love and how it comes to be. 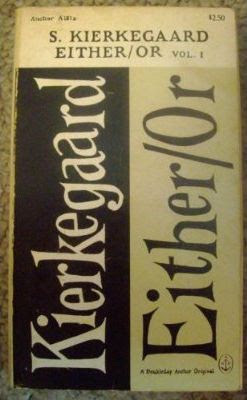 If this is the case, then B’s program represents a retrogression from that of A.
Soren Kierkegaard, Either/Or; a Fragment of Life, translated by D. F. Swenson and L. M. Swenson. 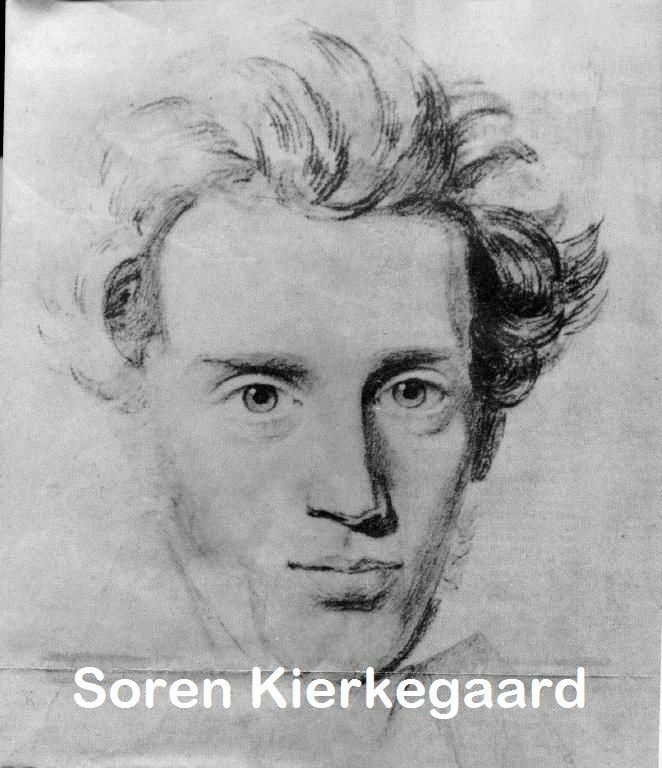 Soren Kierkegaard, Either/Or; a Fragment of Life, translated by D. F. Swenson and L. M. Swenson, vol. II, p. 13.